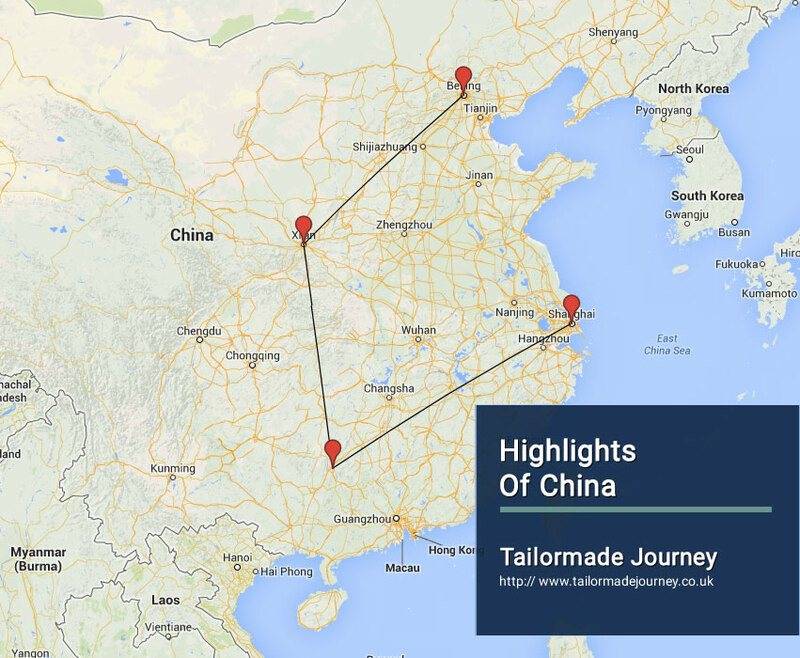 This tailormade programme gives one the Best for Sites of China. Beijing the Capital City of China, Visit the Silk Road and Terracotta Army in Xian, enjoy the Li River Cruise in Guilin and in the end to Shanghai. Beijing 3 Nights > Flight Xian 2 Nights > Flight Guilin 2 Nights > Flight Shanghai 2 Nights & Leave. Overnight Stay at the Hotel in Beijing. Full day city excursion to Tiananmen Square-the largest square in the world, Forbidden City-imperial Palace of Ming and Qing Dynasty, and Temple of Heaven-here ancient emperors prayed for good harvest. The Forbidden City: the imperial palace for the Ming and Qing with a history of around 600 years. The Temple of Heaven: The Temple of Heaven is a masterpiece of architecture and landscape design which simply and graphically illustrates a cosmogony of great importance for the evolution of one of the world’s great civilizations. Visit to Shaanxi Historical Museum and Ancient City Wall. The Provincial Museum: Which is one of the best Museum in China and where you can learn a lot about the 5,000 year brilliant history of China. The Ancient City Wall: Xian City Wall was constructed in the early Ming Dynasty on the basis of the Imperial City of Chang An (Everlasting Peace) of the Tang Dynasty. Overnight Stay at the Hotel in Xian. Full day excursion to world famous Terracotta Warriors and Horses with circle movie showed before returning to the city for visit of the big wild Goose Pagoda and the Grand Mosque. Lunch at local restaurant. Enjoy Tang Dynasty dinner and show in the evening. Later tour to Reed Flute Cave and Elephant Trunk Hill with lunch en route. Elephant Trunk Hill: the symbol of Guilin landscape. The Reed Flute Cave: Inside this cave you will find many stalactites, stalagmites, stone pillars, stone curtains and stone flowers in numerous forms. Overnight Stay at the Hotel in Guilin. Breakfast at the Hotel. Enjoy the Li River Cruise with lunch on board. The ship will disembark in Yangshuo. Stroll at the famous West Street-where you could buy some small souvenirs for relatives and friends. on this way back, driver will give you several stops somewhere for taking pictures of rice paddies and water buffaloes. Li River Cruise: Guilin scenery is acclaimed as the “Best Under Heaven” and the most beautiful scenes are found along the Li-River. Gorgeous Karst peaks give you surprises at each bend of the limpid river under the blue sky. Water buffalo patrol the fields, peasants reap rice paddies, school kids and fisherman float by on bamboo rafts. With its breathtaking scenery and taste of a life far removed from the concrete metropolis, the scenery along the Li River become one of China’s top tourist destinations. Nanjing Road: the longest commercial street in China, lined with big department and specialty stores, upscale boutiques, and a variety of fine restaurants, enjoying the reputation of “China’s No.1 Street”. The Bund: known as a miniature museum of international architecture with dozens of high buildings standing along the shore. Overnight Stay at the Hotel in Shanghai. French Concession:was a foreign concession in Shanghai, China from 1849 until 1946, and it was progressively expanded in the late 19th and early 20th centuries. Overnight Stay at the Hotel in Shanghai . Today you are transferred to Shanghai Airport to board Flight for Onward Journey. Shangri-La Hotel Guilin overlooks the picturesque Li River. It offers luxurious rooms with king-size beds and free WiFi. It also features 2 swimming pools and a tennis court. The Shangri-La Hotel is only 10 minutes’ drive from Guilin city centre and Guilin Exhibition Centre. It is an 11-minute drive from Reed Flute Cave and a 15-minute drive from Xiangshan Scenic Area. Liangjiang International Airport is about an hour's drive away. The elegant rooms of Guilin Shangri-La Hotel are well-equipped with air conditioning, satellite TV and a choice of pillows. Rooms also provide bathrobes, tea and coffee making facilities and work desks. Guests may take a stroll in the lovely garden after a day of tours. There 1800-square-metre pillar-less ballroom can accommodate up to 1600 people. There is also a kids' club. The Shangri-La offers guests a choice of restaurants and bars. The Signature Shang Palace features a variety of Cantonese, Hunanese, Huaiyang and Guilin cuisine. Li Cafe offers Western cuisine. Grand Link Hotel is a 10-minute walk from Qixing Park and a 10-minute drive from Guilin Railway Station. This spectacular 5-star hotel features gardens in spring, summer, autumn and winter themes. It has 5 dining options and a seasonal outdoor pool. It offers free parking and free Wi-Fi in all areas. Guest rooms feature spacious interiors and have an oriental touch. Amenities include a minibar, a large work space and a flat-screen TV with satellite channels. Most rooms come with views of the garden or the Lijiang River. There is a fitness centre on site. The staff at the tour desk is able to assist with making travel arrangements. Dining options include Royal Orchid Café , Hexi Chinese Restaurant, Balmy Restaurant, Whisper Garden Lounge and Japanese Restaurant. Guests can enjoy European and American cuisine, Guangxi food, Cantonese cuisine and Thai food on site. Hotel Grand Link is a 10-minute drive from Lijiang and 31 km from the Guilin Liangjiang Airport. Holiday Inn Express Zhabei is a 5-minute walk from Shanghai Railway Station, Shanghai Long-Distance Bus Terminal and Shanghai Tourism Center. It offers affordable rooms featuring free internet access and a flat-screen TV. Popular attractions such as Nanjing Road Pedestrian Street and People’s Square are a 10-minute drive away. Shanghai Railway metro station (line 3 and line 4) is an 8-mintue walk away. Guestrooms at Zhabei Holiday Inn Express are fitted with air conditioning and ample workspace. They feature satellite TV and a tea/coffee maker. A safety deposit box and hairdryer are also provided. A tour desk helps guests with trip planning and offers information on local attractions. Buffet breakfast is served at the hotel’s café. The hotel’s lounge offers light meals and drinks. Lee Gardens Hotel Shanghai is a 10-minute drive from Xujiahui Shopping District and a 15-minute drive from the Huai Hai Road Shopping Area. It offers a restaurant and rooms with free Wi-Fi. Air-conditioned guest rooms are fitted with a personal safe, tea/coffee making facilities and a flat-screen TV with cable channels. The en suite bathroom comes with toiletries and a bathtub. Guests can enjoy a game of tennis at the on site tennis court. Laundry and dry cleaning services are available. Luggage storage can be found at the 24-hour front desk. The on-site Hao She Restaurant serves a selection of local dishes. Shanghai Xuhui International Executive Suites is 200 m from Dong'an Road Subway Station (line 4 and 7) and a 15-minute taxi ride from People's Square. It is a 1-hour drive from Pudong International Airport. Xuhui is a great choice for travellers interested in food, shopping and city walks. Crowne Plaza Xi'an is located within Shaanxi Xinxi Tower, one of the tallest buildings in Xi'an. Occupying Floor 25 and above, this 5-star property has an indoor pool, a fitness centre and free parking. Overlooking the city skyline, the air-conditioned rooms have free Wi-Fi and enjoy 24-hour room service. Situated next to Shaanxi Stadium, Crowne Plaza is surrounded by Small Wild Goose Pagoda, Shaanxi International Exhibition Centre and Xi'an Museum. It is a 12-minute drive from Big Wild Goose Pagoda and Tang Paradise, a 15-minute drive from the Bell and Drum Tower and Muslim Food Street. The shengtiyuchang Subway Station (Line 2) is located only a 5-mintue drive away, which provides easy access to the top attractions. Xi'an Xianyang International Airport is a 45-minute car journey away. Fitted with dark wood furnishings and carpeted flooring, the elegant rooms are equipped with a flat-screen TV and a minibar. A walk-in wardroeb and Ironing facilities are included. Shangri-La Hotel Xi'an is a luxurious 5-star hotel situated in the Gaoxin High-tech Development Zone, and a 35-minute drive from Xi’an Xianyang International Airport. It offers stylish accommodation with 4 dining options, an indoor pool and rooms with free wired internet and Wi-Fi. Convenient transportation and good locations of Shangri-La Hotel Xi'an, is easy to reach many top tourist attractions, including the Terracotta Warriors Museum and Ming City Wall. Spacious guest rooms offer modern furnishings and are fully air conditioned. Each is equipped with a work desk, tea/coffee making facilities and a flat-screen TV with cable channels. A spacious marble bathroom comes with a separate shower and bathtub. Guests can work out at the fitness centre or relax with a massage. The hotel features luxurious spa and a 24-hour fully equipped health club with heated pool, which is a perfect place to soothe mind, body and soul. Besides, staff at the tour desk can assist with making travel arrangements. Yi Cafe serves a selection of western dishes. Chinese food can be found at the Tian Xiang Ge Restaurant, while Siam Garden offers a variety of Thai delicacies. Drinks and light snacks can be enjoyed at the lobby bar. Park Hyatt Beijing is centrally located in the heart of the CBD, directly opposite the China World Trade Centre and the new CCTV Tower. Overlooking the bustling city centre, the gorgeous 5-star property boasts an impressive selection of 12 event spaces for various occasions, a traditional Chinese-inspired Tian Spa and several stylish dining options. Free Wi-Fi is provided throughout. Situated in Chaoyang District, Park Hyatt Beijing is a short 3-minute stroll from Jianwai SOHO and a 5-minute drive from No.1 Embassy District. The Exit C of Guomao Subway Interchange Station (Line 1 and 10) is steps away, which provides easy access to the majority of top tourist attractions. Beijing Capital International Airport is 25 km away. The Contemporary décor and rich colours create a luxurious and elegant atmosphere. Each guestroom is fitted with a flat-screen TV, safety deposit box, DVD player and Espresso machine. The spa-inspired limestone bathroom features a walk-in shower, a bathtub and heated floor.